Ah, Mars, the red planet. Some believe we're on the cusp of finding evidence of life up there. Some folks are even willing to buy one-way tickets to the planet knowing they'll never be able to come back home. But what if you could see it without having to bother with all of that "leaving Earth behind forever and ever" thing? Well worry not, Bohemia Interactive wants to save you the time and effort of committing your life to space. Today they announced Take On Mars, the newest addition to their Take On series of flight simulators. 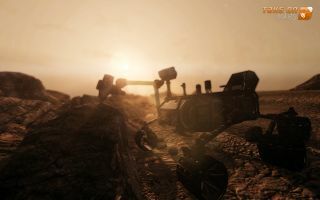 In it, you'll be piloting various Rovers or Landers and exploring the rustic dunes of the fourth planet from the Sun. The trailer shows everything from night exploration, to poking rocks with a laser, to even what appears to be a botched landing that will undoubtedly leave many simulated earthlings feeling very distraught. What I'm looking forward to is what's not in the trailer though. Alien life? Actual water? Space zombies ? Bohemia has said that the game will be heavily aimed at modability, so it's actually possible we'll get to see all of that and more once modders start taking a crack at it. Expect to take on Mars later this year as a digital download for about $13.00 USD.